New information: On 14 December 1999, the Centre received a report on a workshop entitled - Srebarna Nature Reserve – core site of the European Ecological Network. The workshop was held from 25 to 27 September 1999 at Srebarna Nature Reserve and brought together 28 participants from Government institutions, staff of the Reserve and NGOs. It focused on linking the applications of the World Heritage Convention, Ramsar Convention, Biosphere Reserve concept and other Europe-wide initiatives, such as those of BirdLife Network, Natura 2000 and the European Habitat Directive, to the conservation of Srebarna. The workshop also explored possibilities to involve local population in the conservation of the site and to orient management to improve the living standards of the local people resident in and around the Reserve. IUCN has suggested that the State Party continue to monitor the impact of the cyanide spill as well as that of other major pollutants in the Lake. The Bureau recommends that the Committee retain this site in the List of World Heritage in Danger. The Bureau encourages the State Party and the relevant national authorities to continue their efforts to link the different initiatives at the national, European and international level to mitigate threats to the site. The Bureau requests the State Party to submit a state of conservation report by 15 September 2000, addressing amongst others, effectiveness of the rehabilitation programme currently being implemented by the State Party. Based on a review of that report, IUCN and the Centre may propose to the twenty-fourth session of the Committee, a process and a time-table for an assessment of the results of the restoration of Srebarna and its possible removal from the List of World Heritage in Danger in 2001. At its twenty-fourth ordinary session from 26 June to 1 July 2000, the Bureau noted that a cyanide spill in the Danube River had been contained without any major impacts to the integrity of the site. Nevertheless, the Bureau had encouraged the State Party to continue to monitor the impact of the spill and other major pollutants entering the Lake. The state of conservation report from the State Party due by 15 September 2000, as recommended by the twenty-fourth ordinary session of the Bureau, has not yet been received by the Centre at the time of the preparation of this report. The Bureau noted that a workshop held from 25 to 27 September 1999 at this site had brought together twenty-eight participants from Government institutions, staff of the Reserve and NGOs. The workshop focused on linking the applications of the World Heritage Convention, Ramsar Convention, Biosphere Reserve concept and other Europe-wide initiatives, such as those of BirdLife Network, Natura 2000 and the European Habitat Directive, to the conservation of Srebarna Nature Reserve. The workshop also explored possibilities to involve the local population in the conservation of the site and to orient management to improve the living standards of the local people resident in and around the Reserve. Pollution due to heavy metals, chlorinated hydrocarbons and other pollutants originating from lands immediately surrounding the Lake are potentially of greater concern than the impact of the cyanide spill to the long-term conservation of Srebarna. The Bureau noted that monitoring of cyanide levels in the Lake had commenced in February 2000 and suggested that the State Party continue to monitor the impact of the cyanide spill as well as that of other major pollutants entering the Lake. On the overall impact of the cyanide spill, also refer to paragraph IV.45. The Bureau recommended that the Committee retain this site in the List of World Heritage in Danger. The Bureau encouraged the State Party and the relevant national authorities to continue their efforts to link the different initiatives at the national, European and international level to mitigate threats to the site. The Bureau requested the State Party to submit a state of conservation report by 15 September 2000, addressing amongst others, effectiveness of the rehabilitation programme currently being implemented by the State Party. The Bureau asked the Centre and IUCN to review that report and propose to the twenty-fourth session of the Committee, a process and a time-table for an assessment of the results of the restoration of Srebarna and its possible removal from the List of World Heritage in Danger in 2001. The Committee was informed that the Minister of Environment and Water, by a letter dated 11 September 2000, has transmitted a state of conservation report to the Centre. The report reached the Centre only on 17 November 2000 and hence allowed only a preliminary desk-review by IUCN. The report describes changes in physical (e.g. 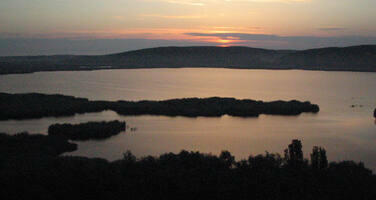 water quality) and biodiversity indicators that show improvements in the state of conservation of the site. It outlines measures taken by the State Party to strengthen social, cultural and political support for the protection of the site, including regional and international arrangements made to co-ordinate the overall protection of wetlands in the Danube River basin. The report stresses the fact that the improvements registered in the state of conservation of the site, including the administrative and organizational arrangements put in place to sustain those improvements, justify the removal of Srebarna from the List of World Heritage in Danger by the twenty-fourth session of the Committee. However, IUCN, while noting the positive achievements in the state of conservation reported, suggested that the Committee defer its consideration of the removal of Srebarna from the List of World Heritage in Danger until a site visit is undertaken to assess the results of the rehabilitation efforts reported by the State Party. The Committee thanked and commended the State Party for submitting a comprehensive report and for its efforts to fully rehabilitate the site. The Committee requested the Centre and IUCN to co-operate with the Ramsar Convention Secretariat and other suitable partners to field a mission to the site to undertake a thorough evaluation of the successes of the rehabilitation efforts reported and their sustainability. The Committee asked the Centre and IUCN to submit a report to the twenty-fifth session of the Committee in 2001, advising the Committee whether it could remove Srebarna from the List of World Heritage in Danger and of the next steps in preparing a trans-national, multi-country Danube Delta World Heritage area nomination incorporating designated and potential World Heritage areas of the Danube Delta River Basin. The Committee retained the site in the List of World Heritage in Danger. The Committee may wish to review new information that may be available at the time of its session and take necessary decisions and recommend appropriate actions to the consideration of the State Party, advisory bodies and the Centre.